Entrepreneurship in itself is hard work. It certainly is rewarding but also includes its share of risks and responsibilities. Solopreneurship being different from entrepreneurship, the same risks and stress double up. Things become tougher when you are functioning all by yourself and can depend on only yourself and no one else. In situations like these, it is obvious for solopreneurs protective instincts to kick in. Solopreneurs are usually skeptical when it comes to outsourcing a work or a task of importance. Delegating a task that holds value for your venture, is a very dicey aspect. Nonetheless, it is important that you outsource your tasks to third parties or vendors. Not only is this time efficient but also lets you focus on other important aspects of your business. Choosing the right vendor partner, is not just a one time fling. They can potentially make or break yours and your businesses stance, unlike any other single purchase or deal you take. 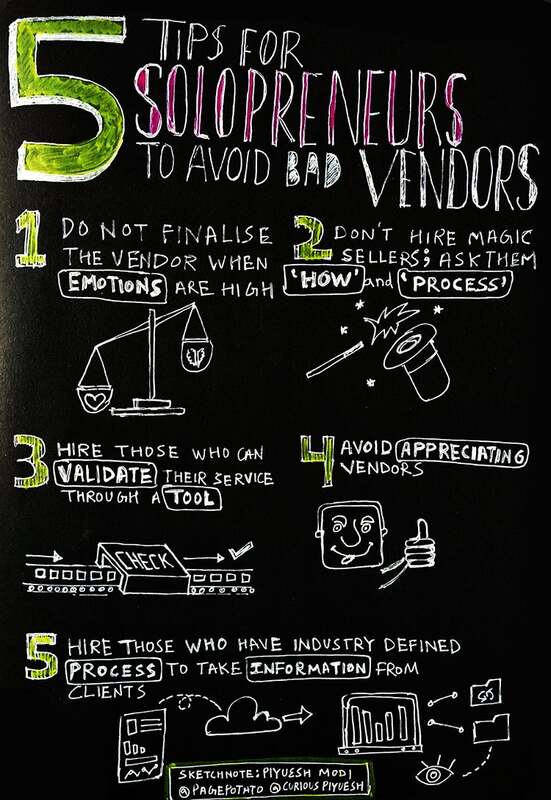 However, like most other things in life, hiring a vendor is in the grey area. There’s certainly no full proof way of knowing if the vendor you hired will deliver exactly what you expect out of them. But it is certainly possible to minimize the chances of hiring a total fraud. As a solopreneur you have to calculate the risks and evaluate how you are being affected by the partnership. Never make decision when you are super happy or super sad. Life for a solopreneur is full of mixed emotions, no day is similar to another. When it comes to taking major decisions for your business, like hiring vendors, make sure you think it through. Usually, stress gets the better of us and it becomes too late to recover from the loss. Enjoy your moment of glory or loss, sleep over it and take out time to discuss it with others of value. Never hire a vendor who sells magic, mostly because we solopreneurs of all people know magic isn’t real. It’s a vendor’s job to exaggerate and get the project from you. Understand that he will try his best possible means and strategies to excite you into giving in. Don’t take airy statements that can’t be proved. The other day a vendor came in saying, he has worked for a big publishing house I admire a lot. The statement is surely seducing, but doesn’t make sense if he can’t prove his words. Always ask what process they plan to work with and what approach they are panning for your business. This will tell you about their understanding of your business and to some extent the truth behind their words. Statements like, “Relax, I will take care of your business like it was my own” doesn’t make sense if he can’t tell you how he plans to do it. Don’t get biased towards appreciation. We, solopreneurs, are big suckers for appreciation. Given the fact that we put so much hard work and such unique thoughts into it, we deserve it. As a solopreneur, it is natural to feel good when some outsider recognizes your hard work and appreciates how you are handling the business. Enjoy the glory, but always remember they are doing it to impress you for their own benefit. Avoid this bias and avoid taking decisions in this feel good moment. Always ask the vendor his/her process to take information from you. A vendor who doesn’t have an established/written way to take information from you is surely going to screw up later. Not only does this say how ineffective his process is, but also talks volumes about him being inexperienced. Have you checked the reviews and projects the vendor has taken up in the past? Is the customer service of the vendor responsive? Is the process followed by the vendor in line with your business? Is the vendor willing to work with the Service Level agreement you provide? Is the vendor willing to be transparent at all times? All these points apart, always remember to be wary. Check what kind of relationships you make with these vendors. Relationships, that you make with your partner, your clients and your vendors can define your business greatly. Take a pat on your back for doing it right as a solopreneur till now! Why is it Important Not to Be in Isolation in Small Business?